The length of a cable chain is dependent on three factors. 1. The length of travel. 3. Where the cable chain is mounted. If you quickly want to calculate how long a cable chain is required, the following formula is a good shortcut. Chain mounted in the centre of the travel. 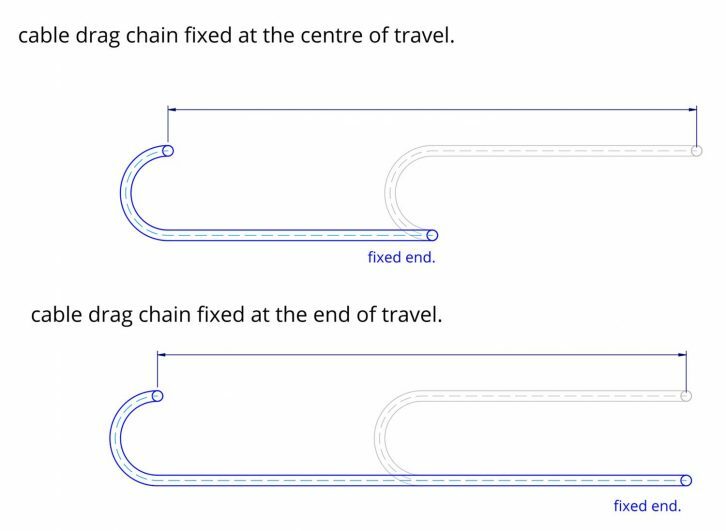 The most common place to mount a cable drag chain is at the centre of the travel. By mounting it in the centre of travel you will need the shortest length of chain to achieve it. Chain mounted at the end of the travel. Above is a sketch showing the difference between a chain mounted in the centre of the travel and one mounted at the end. The above formula is really only a rough guide for making a quick assessment.